Dutch civic guards group portraits of the 17th century are world famous both for their artistic merit and as a genre unique to art. Invariably we see in these incredibly large paintings men dressed in all their finery, posing formally or seated around a table enjoying copious festive meals. A unique summer exhibition in Amsterdam’s former Town Hall, today the Royal Palace, has united several Amsterdam civic guards paintings in their 18th century location following the description by the city appointed painter/restorer Jan van Dyk (c. 1690-1769). What makes this exhibition even more unique is that it is held in two rooms on the third floor of the Palace that have not been open to the public in two hundred years: the Large and Small War Council Rooms (fig. 1). The exhibition is an excellent opportunity to explore Amsterdam civic guards portraits in more detail. In this first post: artistic and historical origins. As we shall see, the artistic beginnings were humble. In addition, early civic guards portraits are generally poorly preserved, a fact that was noted as early as 1653 when Gerard Schaep writes: “An old piece. In which my great-grandfather Jacob Schaep Pietersz is in the foreground. But the painting is becoming unrecognisable because of the flaking.” I nevertheless think it is worth while to trace the artistic and historical background of this unique genre of paintings. Perhaps the earliest manifestation of Dutch group portraits, that is to say: still within a religious context but no longer on (memorial) altars and consisting of groups of individuals rather than of members of a family, are portraits of Jerusalem Pilgrims. The majority of these are lost but it is known from archival sources that several were produced in Amsterdam. Not all members made the pilgrimage to the Holy Land: to become a member it sufficed to have the intention to go there. A rare survival is the portrait of four Amsterdam Jerusalem pilgrims showing them kneeling in much in the same way as families were depicted on traditional memorial altars, but here they are shown in the crypt of the Church of the Nativity in Bethlehem, a long way from home (fig. 2). Jerusalem pilgrims, mostly non-clergy belonged to a confraternity consisting of wealthy men and women. They had their own dedicated chapel: Saint Olof’s next to the medieval Saint Olof city gate (fig. 3). Jerusalem Pilgrims portraits seem to be a strong personal influence in the development of certain artists such as Jan van Scorel (1495-1562) (fig. 4) who, as we have seen, was a pupil of Amsterdam painter Jacob Cornelisz van Oostsanen. It is tempting to think that Jacob’s son Dirck Jacobsz (1487-1567), painter of the earliest surviving civic guards portrait (1529) was familiar with his work. As suggested in my second post on Van Oostsanen, it is not inconceivable that Van Scorel, upon his return from Italy, spent some time in Amsterdam visiting his former Master’s studio. Dirck Jacobs’ portraits certainly betray manneristic influences such as we see in Van Scorel’s paintings after his return from Italy in 1518. Van Scorel may have been the first artist to dispense with a religious spiritual setting and to portray his sitters in a static row. The palm branch each pilgrim carries symbolises both their participation in the pilgrimage and their role in the annual Palm Procession where their task was to accompany a “Palm Donkey”, a life-size sculpture of Christ on a donkey, the symbol of Christ’s entry into Jerusalem. Apart from their religious and charitable duties, the confraternity also gathered socially, for instance during annual festive meals. In this, it did not differ from the civic guards guilds. Both had communal duties, both enjoyed privileges in return. Another similarity was that civic guard membership, given the expensive equipment members were expected to acquire at their own costs, was restricted to the more affluent citizens. And of course, if you wanted to be included in a group portrait, you had to be able to afford to pay your share. Both the Jerusalem Pilgrims and the civic guards did differ from other guilds in an important respect: in a traditional guild people practising the same craft united whereas the Jerusalem Pilgrims and civic guards members practised different professions. An early Amsterdam civic guards group portrait, today tentatively ascribed to Dirck Jacobsz nephew Cornelis Anthonisz (1500-1561) shows a composition very similar to Van Scorel’s Jerusalem Pilgrims (fig. 5). In addition, apart from the seventeen civic guards being clad in full harnass, the imaginary Italianate landscape is reminiscent of Van Scorel’s work. Given Van Scorel’s demonstrable influence on his portraits, I am inclined to suggest Dirck Jacobsz or an anonymous collaborator as its possible author. The inscriptions on the labels quoting the philosopher Seneca in Latin and Dutch emphasise the Christian moral duty of the civic guards: “We are bonded by this solemn oath to bear worldly matters patiently and to not let us be affected by matters we do not have the power to avoid. Seneca”. The Latin word Sacramentum refers to the Miracle of Amsterdam and at the top right the host (the sacrament) is being shown by angels. In spite of the first signs of the Reformation having reached Amsterdam, this is still very much a catholic painting. In the Middle Ages, guarding Amsterdam’s city wall and gates was very much a communal affair. In addition to a small number of paid gatekeepers, nightwatchmen and the schout (sheriff) and his men, each “honest” citizen (that is to say: men who had something to lose should the city be under threat) was required to serve the communitas: they had to contribute to day and night watches and civic militia expeditions, to maintain order, extinguish fires and such. These tasks were clearly defined and strictly controlled in regulations issued by the city’s magistrates. 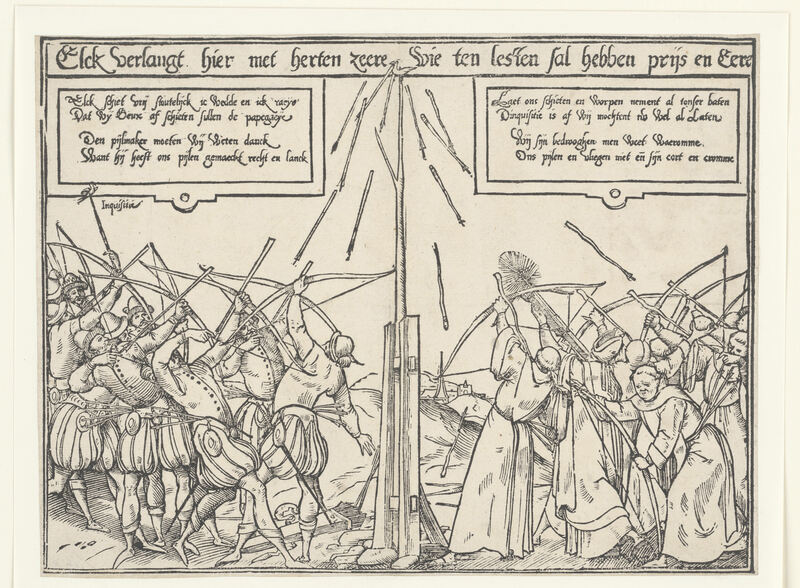 In addition, Amsterdam had some six hundred schutters (shooters) organised in three guilds. The oldest, that of the archers of Saint George, was probably founded in the mid 14th century. In a document of 1471 two other guilds are mentioned, the “young archers” of Saint George (meaning simply founded later than the older guild of the same name) and the crossbowmen of Saint Sebastian (fig. 7). The old Saint George guild ran into financial difficulties and was disbanded in 1516; in 1520 it re-emerged as the Kloveniers, immortalised, among others, in Rembrandt’s Nightwatch over a century later. 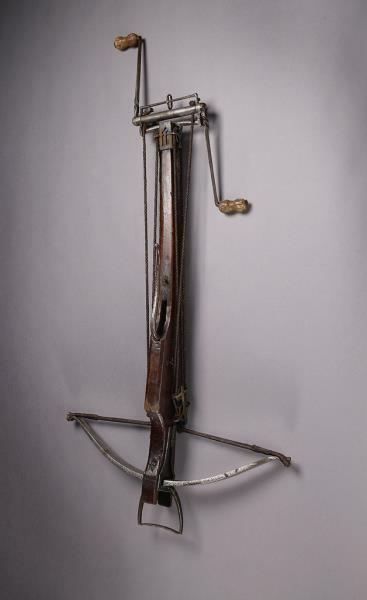 They were named after the klover (arquebus), the firearm that replaced the old-fashioned longbow. The klover was also, after some resistance, adopted by the other guilds although they kept their traditional names of archers (handboog) and crossbow (voetboog) guild. Each company was initially divided into twelve rotten (divisions) of seventeen men each. The civic guards guilds had their own headquarters (doelen) with well appointed shooting ranges. These can clearly be identified on Cornelis Anthonisz’ bird’s eye view map of 1544 (figs. 8 and 9). In addition to their militia duties, the men also had specific privileges such as annual shooting contests held in May, participating in parades and processions (for instance on the occasion of an important foreign visit such as that of the Emperor Charles V in 1515), copious banquets enlivened by music and plays (fig. 10) (described by their detractors as “gorging, boozing and reveling”), and holding religious services in beautifully appointed guild chapels in one of the city’s churches. The annual shooting contests were called papegaaischieten. The men could demonstrate their prowess with firearms, longbow and crossbow by shooting a wooden bird (the “parrot”) from a tall pole and the winners were crowned “king” of a respective guild for one year. Winners were entitled to wear the costly guild chain and to carry the guild’s scepter. The exquisitely crafted guild chains of the mid-16th century preserved in the Amsterdam Museum testify to the wealth of these guilds (figs. 11 and 12). Elaborately decorated drinking horns (figs. 13 and 14) commissioned around the same time as the chains were obviously a symbol of pride for the civic guards companies as they feature in several 17th century guards portraits (for example see fig. 15). 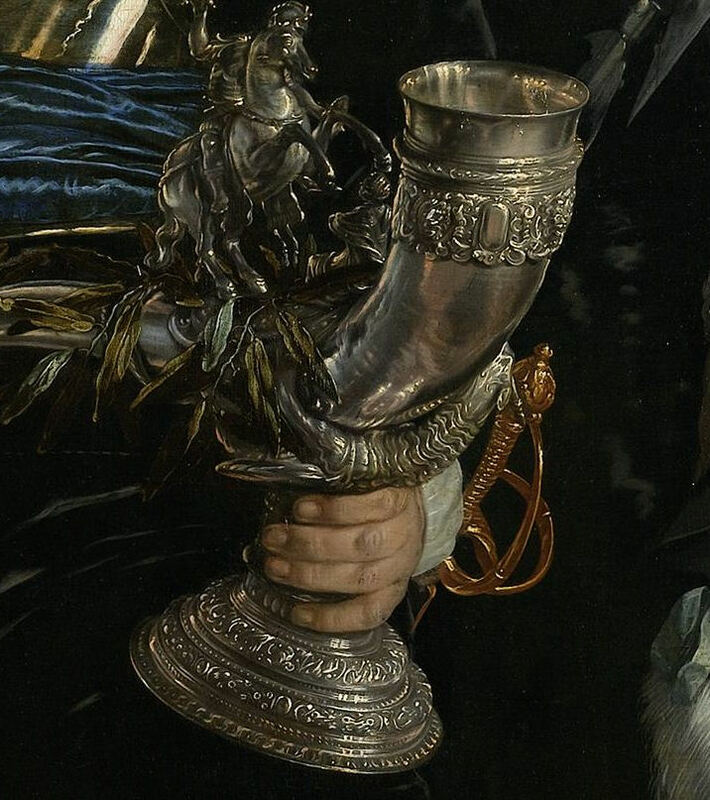 They continued to have a ceremonial function: important agreements were symbolically concluded by the governors of a civic guard company drinking wine from the beautifully crafted guild drinking horn. Sometimes a winner of the parrot shooting contest got extremely lucky: a painting of a “prize ox” adorned with laurels, dated 1564 (fig. 17), describes on the frame and on the painting how one Jacob Reyersz Boon won the parrot shooting contest in two consecutive years, so that apart from becoming “guild king” he was also awarded the additional prize of a magnificent ox, 1.5 meters tall and measuring three meters in circumference. Amsterdam was not yet as urbanised as it would become in later years and the cattle market was still held in the Kalverstraat close to Dam Square. An ox therefore does not seem such a strange prize at the time. 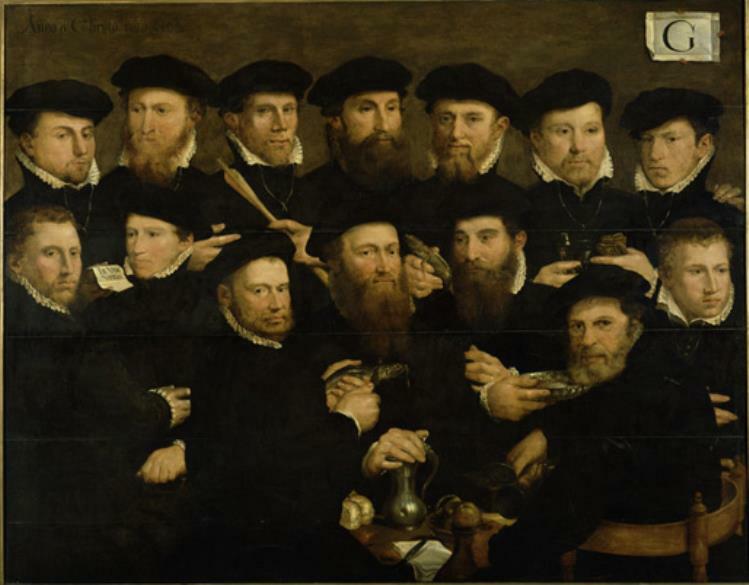 A curious group portrait dated 1534 shows eighteen civic guards including two “kings” in a prominent position, identifiable by the guild chains they wear (each guild only had one so the painter simply copied it) and the scepter they are holding (fig. 16). The second “king” is presumably a civic guard of the same division who won the shooting contest the year before and who, in 1534, was no longer a member of the division which explains why eighteen and not the customary seventeen guards are depicted. Between the two “kings” stands a rifleman loading his klover; apparently they are men of the Kloveniers guild. The landscape is a fantasy landscape with castles, just as in the group portrait attributed to Cornelis Anthonisz above (fig. 5). The panel is heavily overpainted and attribution is therefore difficult: the “king” on the left, for instance, is entirely the work of an early restorer. Were armed civic guards, consisting essentially of armed, well-to-do citizens, necessary? Certainly Amsterdam faced threats from the outside. In the Middle Ages the Bishops of Utrecht, for example, sought dominance over the city and a military siege was a realistic threat. Not for nothing was the city wall gate facing in the direction of Utrecht ominously called Swych Utrecht (literally: “be silent, Utrecht”; presumably from the word “zwicht” which means “surrender”). As long as the danger came from the other side of the robust city walls, the city was fairly well protected by its well organised and committed community. But as soon as the city’s peace was threatened from within, the city’s civic militias proved less adequate. Two causes can be named in this respect: the rapid growth of the population, bringing with it over-population with its resulting rise in criminality and, a greater threat, the problem posed by the Reformation which essentially came to divide the city in the 16th century (fig. 18). 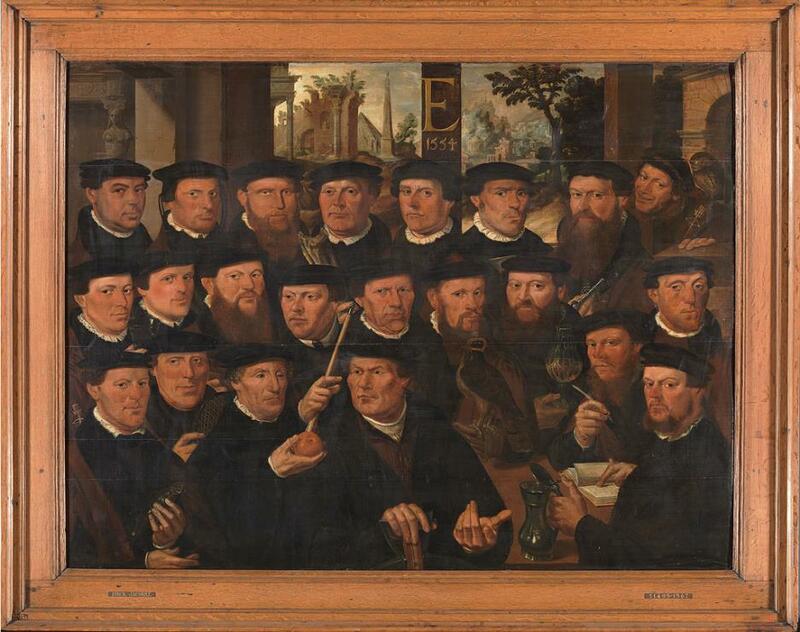 It is not surprising that the series of civic guards group portraits, steadily added to from 1529 onwards, was interrupted during times of civic unrest: the Anabaptist rebellion of 1535 resulting in the change of the city’s government in 1538, the Iconoclasm of 1566 (during which the civic guards chose the side of the rampaging Calvinists) and the “civil war” of 1617-1619. In 1578 the civic militias played a decisive role in the city’s ultimate adoption of Protestantism, the Alteration, and it was they who physically ousted the catholic magistrates from the city. Important as they were in keeping the peace within the city walls, being armed and organised they also posed an inherent danger to that very peace and order. To keep this danger at bay, the city magistrates saw to it that the guards’ captains and governors were appointed from within their intimate circles. When the old Saint George’s guild was disbanded, its headquarters were sold to pay off the guild’s debts and when, in 1520, they re-formed as the Kloveniers guild, the city placed the medieval city wall tower Swych Utrecht at their disposal to use as headquarters (fig. 19). Once the oldest, now the youngest and lowest ranking of the civic militia companies, the cramped premises of Swijgh Utrecht contrasted sharply with the magnificent headquarters of the Voetboog and Handboog civic guards on the Singel; particularly the latter could boast of a splendid building rising high above its surroundings (fig. 20). 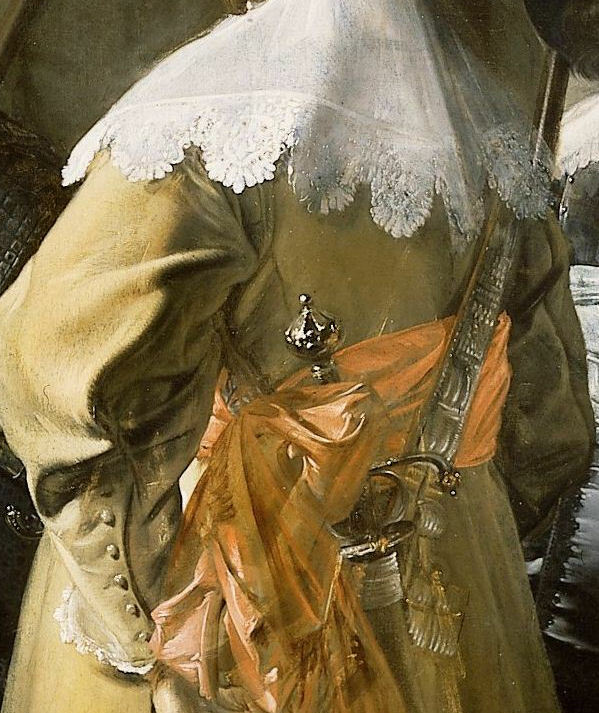 It is possible that envy caused artistic rivalry: once the Kloveniers had initiated the first group portraits, the other civic guards companies could not stay behind. Art historically this coincided with the secularisation of the painted portrait in Amsterdam, something that had already occurred in Flanders and Italy. For Amsterdam painters, who were faced with the demise of the Catholic Church as their main source of income, this must have come as a godsend. Given the civic guards portraits from the 16th and 17th century that have survived and even taking into account that several have not, the sheer number is staggering and the many commissions must have kept painters extremely busy. It helped that some such as Dirck Cornelisz were civic guard guild members: they no doubt acquired commissions that way. A new artistic impulse was given upon the return from Italy of the painter Dirck Barendsz (1534-1592) who, according to Karel van Mander’s Schilder-boeck (1604), had been “nursed at the great Titian’s bosom”. 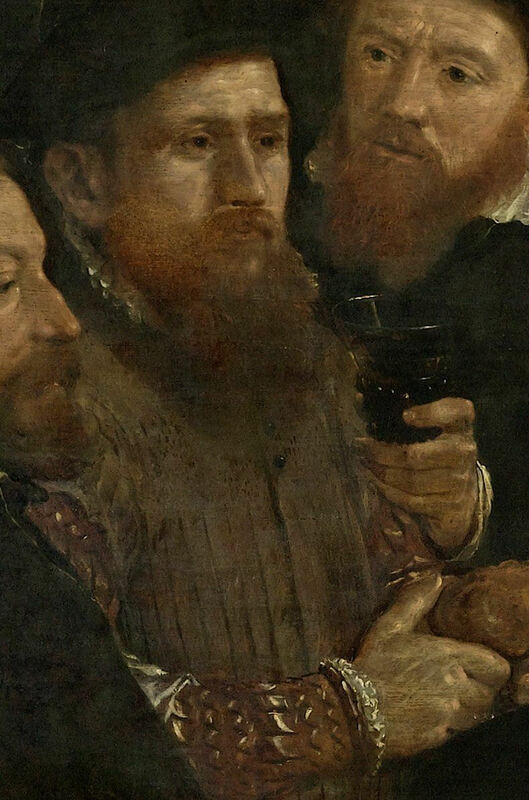 Titian, of course, never painted group portraits. But whereas the earliest group portraits are stiff and formal, with men grouped mostly in one or two rows and that so rigidly that Houbraken (in 1718) remarked that one could “chop off their heads with one single blow” (see for instance fig. 6), and any variety was only achieved in hand gestures or objects men are holding, Barendsz, in his Civic Guards of Division G (1562) (fig. 21), although largely sticking to compositional conventions, nevertheless achieved a freer arrangement, particularly in his far more accomplished treatment of individual facial features. The inscription In Vino Veritas (in wine there is truth) on the note on the table indicates that by the mid-16th century the civic guard companies, apart from their civic duties, enjoyed a rich social life. With his broad technique Barendsz accomplished a plasticity that released the Amsterdam portrait from the rather rigid poses of earlier portraits. Following the innovative composition of Cornelis Anthonisz in his Braspenningmaaltijd of 1531 (fig. 22) (so nicknamed because of the guards’ rather frugal meal: a braspenning coin was worth not much more than five cents), where the sitters are arranged around a dinner table, Barendsz, in his Poseters (Ruffe Eaters, named after the fish they are served) of 1566, took this a step further and achieved a relative liveliness that was new in Amsterdam group portraiture (fig. 23). The merits of Cornelis Anthonisz’ painting, who was himself a member of the Voetboog civic guards, pays great attention to the details on the table and the harmonisation of the colour scheme. The beautiful calligraphy of the letter D was a hallmark of the Van Oostsanen workshop (see previous posts). Quite possibly the man portrayed top left holding a lead pencil in his hand, seated right below the date and signature, is a self-portrait of Cornelis Anthonisz, who was thirty-three years old at the time. What immediately strikes one in 17th century civic guards portraits, such Frans Hals and Pieter Codde’s Militia Company of District XI of 1637 (fig. 24), are the sumptuous colourful costumes, the laces and silks the men are wearing. How different, as we have seen in the examples above, were things during the 16th century. Under the influence of Remonstrantism and humanism but also that of the Spanish court of the Southern Netherlands, both of which prescribed restrained clothing, the men generally wear sober attire consisting of a dark tabard with a doublet underneath. 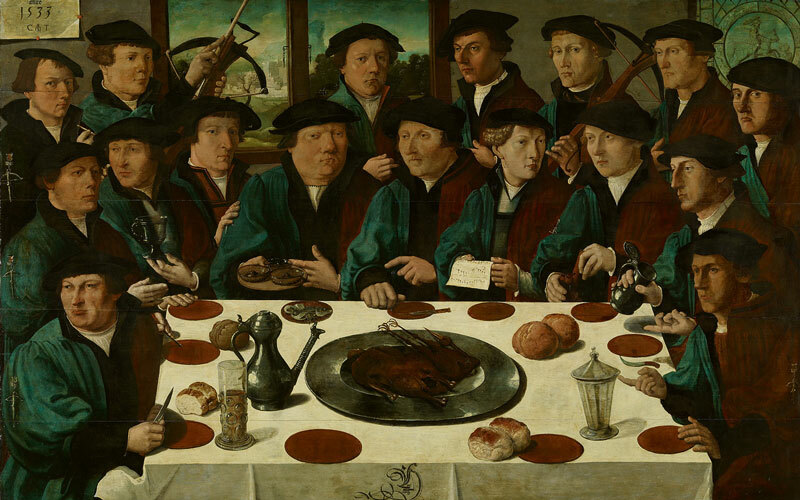 Indeed, observing the earliest group portraits, we see that, for instance in Cornelis Anthonisz’ Braspenning Meal (1533) (fig. 22) all men were the exact same attire, a 16th century custom denoting a group’s social status or class. Fashion followed strict guidelines: decrees and/or social codes dictated who could wear satin, silk brocade, fur or fine and rough linen. An exception to this is the jerkin with vertical splits originally worn by common soldiers, which was essentially a cheap version of the cuirass. It is rather unusual that both the court and citizens followed common soldiers’ fashion. At the Habsburg court the common soldiers’ jerkin was even regarded as an act of defiance (or caricature). Nevertheless, or perhaps even because of this, the jerkin with slits came to be worn by the nobility (fig. 25). Prosperous inhabitants of the cities adopted it too and so, perhaps, defied the strict division of the classes. 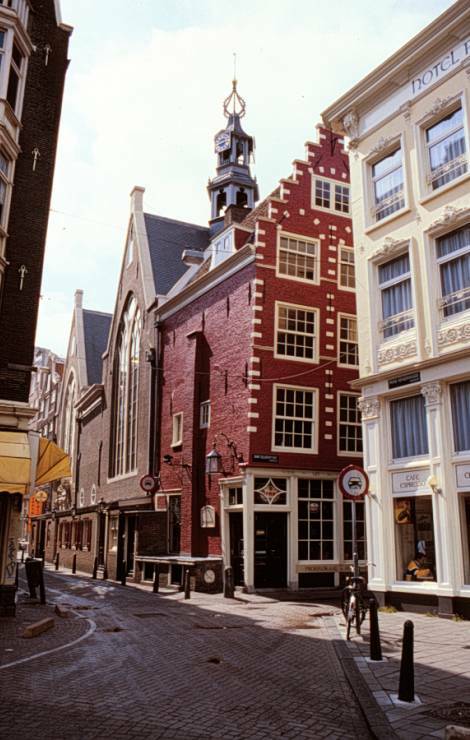 In 1978 a leather jerkin was discovered during dredging works on Amsterdam’s Oudezijds Achterburgwal (fig. 26). It can be dated circa 1550 and may have belonged to a member of a civic guard company. In certain early civic guards portraits one of the men wears a controversial leather jerkin with vertical slits, such as in the Seventeen civic guards of Division F of the Kloveniers where the central figure wears such a jerkin (fig. 27). In Dirck Barendsz Civic Guards of Division G, one of the figures sitting left of the table wears also wears the jerkin (fig. 29) as does the central figure in a 1556 civic guards group portrait. Evidently the choice for such a relatively inexpensive piece of clothing held special meaning for civic guards companies. After all, in spite of their considerable privileges, the men were essentially functioning as the city’s main defence in times of trouble; they were the city’s unpaid soldiers as it were. But perhaps a little defiance on the part of the increasingly emancipated citizens of Amsterdam towards those in power also played a role. In a further conscious or subconscious imitation of the court and nobility, civic guard guilds, who also sported “kings”, employed a fool or tuymelaer (tumbler), a fact that is not generally known. In one unique case, a civic guards painting of the Crossbowmen’s or Voetboog Guild of 1554, a fool is shown (top right), identified by the owl on his shoulder (fig 30). With a small crossbow insignia ironically topped by a crown in his hand, he grins at us conspiratorially. Included too is a hooded falcon, symbolising that ultimate sport of the nobility: the falcon hunt. 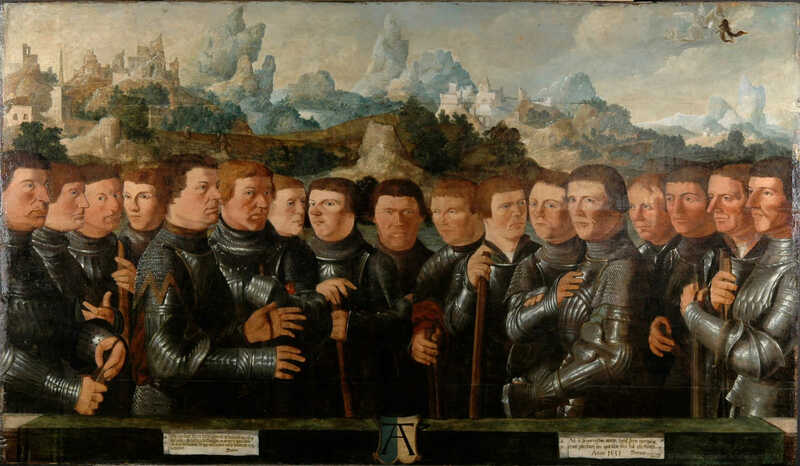 Of all the civic guards portraits of the 16th century, this is the only painting where some of the men portrayed are actually showing an inkling of a smile on their lips and a twinkle in their eye. The exhibition “In All Their Glory” at Amsterdam’s Royal Palace runs until 31 August 2014. There no catalogue, but there is an informative website in English here. For more on the Royal Palace, also see my posts on The Fate of Rembrandt’s Claudius Civilis, Parts 1 and 2. Ownership of the 16th and 17th century group portraits commissioned by Amsterdam’s civic guards gradually reverted to the City of Amsterdam from the third quarter of the 17th century onwards. The majority is still owned by the City and are on permanent loan to the Amsterdam Museum and the Rijksmuseum. It is unique that, with only a few exceptions, these paintings are still located in their city of origine. For selected sources, see the next instalment here. Rembrandt's Room is also on Twitter and Tumblr.